Discussion in 'General Chat' started by roadventure, Feb 9, 2019. Just got a notice that Eurosports (Coopersburg, PA) is going to be closing soon. No definite date, but definitely closing. Well, rats, for all sorts of reasons. Have never been there, but had heard good things. Kathi and I will be driving to NYC later this week, and I planned to stop in there on our way back Friday. Probably still will, but that news takes some of the fun out of it. Any idea why ... besides the usual moto-business plan of "make a million bucks by starting with two?" They just don't have the customer base needed to survive. My experience with them has been positive. allmotive Just got it firing! I live in the area. Been to the dealership a few times. I'm now looking at a Stornello at West Chester Moto Guzzi. They have 3 there. Still undecided on whether I want to deal with the fueling problems with the VII or take the additional power/more vanilla looks of the VIII Stone. They also have a VIII Rough, Milano, Carbon and Special (i think?). Pricing is all around the same. Either way, the Stornello appeals to me the most. It just looks gorgeous. 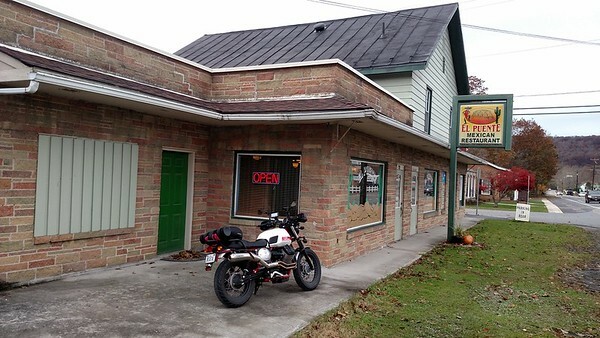 As for the Coopersburg dealer, stopped in on Friday on way back from NYC. Not sure to whom I spoke, but what a nice guy. Have to say that I was surprised that he did not trash Piaggio, and, indeed, was positive about them, particularly with "truthfulness" about parts availability, which he also said was quite good compared to some other brands. We commiserated a bit on the reality of the moto market and I went on. As for the "which Guzzi" issue, well, we are all different, but I am remain smitten by my Stornello. Having said that, I am probably going to buy my brother's V7III Special, too. Despite what others have -- possibly more accurately than my own saddle dyno -- I did not fin much real world differences between my II and his III. My brother doesn't like the Special, but he has a Duc M/S 1200S and is spoiled by its power. P.S. Allmotive, if I don't buy it, and you have any interest in my brother's (blue) Special, email me at wrhagan AT earthlink DOT net. I want it, but have contractors swarming my house just now doing renovation$, so I may pass. It is a shame about Coopersburg. As to which V7, well they are all just different trims of the same bike. First question I would ask yourself is do you want cast wheels or spoked wheels. That is probably one of the biggest differences between the different versions, and a difference that is not easily (cheaply) changeable once you are committed. I like spoked wheels, but I think the cast wheels the V7 offeres are really nice looking cast wheels, and I would want one of the cast wheel versions. The foot peg location makes the 3 more comfortable for short me so it has to be better for an average size guy. Odly i prefer the 5 speed for twisty country / mountain roads. ( less shifting) Either way buy it and if you decide not to keep it you'll find a good home for it. 2 down, just learned Mathew's Fun Machines in NC got bought, new owner won't support them. Not even a bike there already for service. Guess Matthews will be changing their website? Still have 34 new units listed as "in stock". Thanks for the advice and offer Bill! I'm not necessarily interested in the Special at this time. I'm pretty set on the Stornello or Rough. Going to check it out on Saturday to see if I can close the deal. With trade they offer offering me 5K out the door. Understand, and I am probably going to pull trigger on my bro's Special; too fine to pass up. 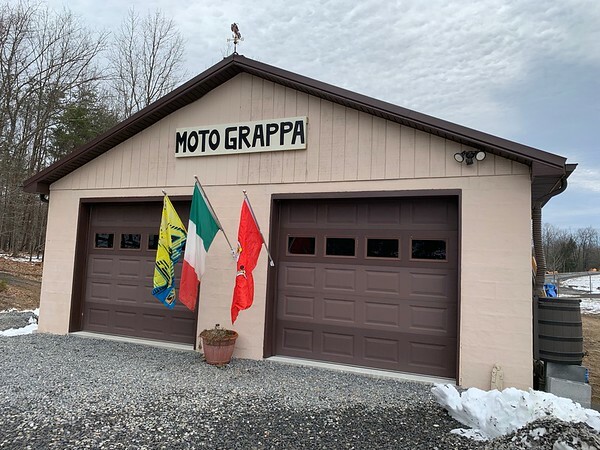 If ever this way -- https://goo.gl/maps/gRSNk3YnC652 -- stop in and visit the Moto Grappa. You know, you are only about an hour away from me in Clear Spring, Md. My garage is not so nice, and right now it is crowded with stuff from the basement flooding. Some day we need to get together. 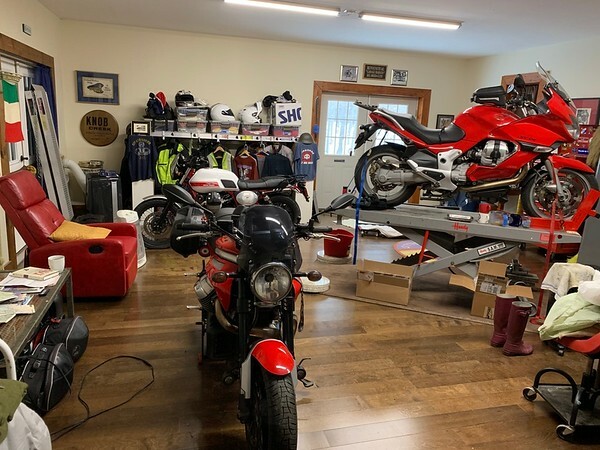 I don't know many people who own as many Guzzi's as we do. And I was just offered a Centauro for about 6 grand. I always wanted one, but I don't think I can justify a 5th Guzzi. I don't have enough time for 4 of them. But I do like that bike. I keep reminding myself that I already have that motor in a Daytona. The EV, Norge, Griso, & Stornello are mine. The Racer is another local rider's, Travis, who trades motorcycles more than anyone I've ever known. He became stranded out here last week by some nasty weather, so it shares floor space with mine for a bit. As for a Centauro, I've been a fan since I stopped in at then-MGNA HQ's in Angier, N.C., in 2001 (?) and one of the guys there showed me a still-in-its-crate dark cherry Centauro. He said it was the last one to come into the U.S. Not sure if true, but i missed my chance. Unlike Travis, I'd probably still have it, and not have bought later the Ballabio and Griso. But c'est la vie. I hear you about five possibly being "a moto too far," but I've always liked that saying that the perfect number of 'em was "present count plus one." 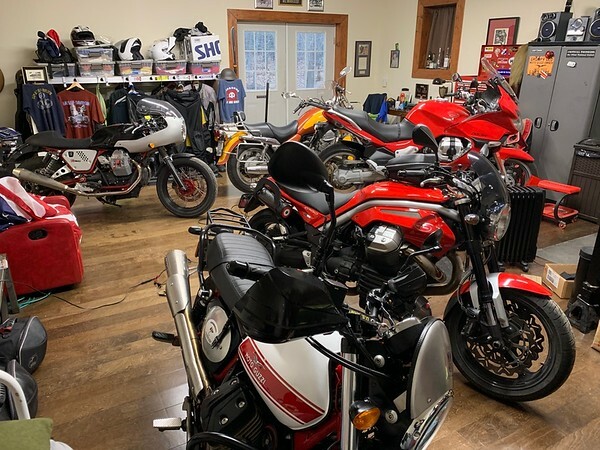 Seriously, I may not keep all of my present moto-harem after I bring in my brother's V7 III later this month, but I'll have a tough time parting with any of them. Yes, only metal, but the miles of memories they have given me me make them crown jewels. Oh, Mexican place in Capon Bridge? Works for me. And, please do visit or arrange for a ride sometime. You have a big room down stairs as i recall. Perfect for a Guzzi museum.